“Know yourself , ” we usually repeat this sentence, but we often lose sight of the true meaning . Concerning the confusion existing about this sentence two questions should be raised : the first concerns the origin of this expression , the second its real meaning and purpose. Some readers may believe that these two issues are completely separate and have no relation between them . After reflexion , and after careful consideration; it is clear that they are closely related . If you ask those who have studied Greek philosophy , who is the man who first had pronounced this wise sentence , most of them will not hesitate to tell that the author of this maxim is Socrates, yet some argue that it can belong to Plato and others to Pythagoras. After these conflicting opinions, we have the right to conclude that this sentence was written by none of these philosophers , and it is not with them that we must seek it s origin, simply because two of these philosophers , Pythagoras and Socrates didn’t leave anything written . As for Plato , whatever its philosophical jurisdiction is , we are not able to distinguish what was said by him or by his teacher Socrates. Pythagoras that Plato collected some of the knowledge that he shows in his dialogues . According to this we see that it is extremely difficult to define what belongs to all three philosophers. What it is attributed to Plato is often attributed to Socrates , and among the theories covered , some are both prior to and come from the school of Pythagoras or from Pythagoras himself. In reality , the origin of this expression goes much higher than the three philosophers listed herein . Indeed it s is older than the history of philosophy , and also beyond the realm of philosophy. 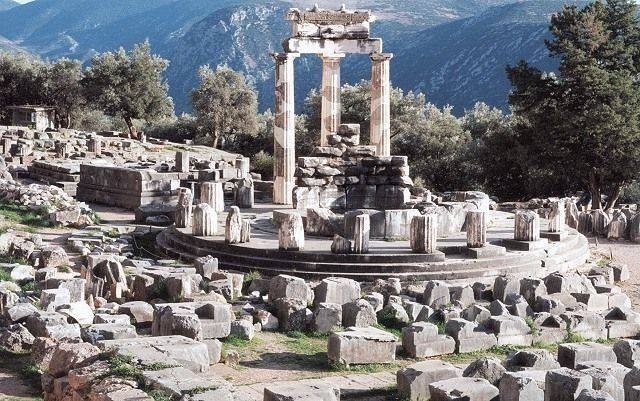 It is said that these words were inscribed above the door of Apollo at Delphi. They were then adopted by Socrates, as they were by other philosophers, as a principle of their teaching, despite the differences that have existed between these teachings and aims of their authors . It is probable that Pythagoras also used this phrase before Socrates. Thus , these philosophers proposed to show that their teaching was not their strictly personal , it came from a point of departure oldest ,higher point connected to the source of the original inspiration , spontaneous and divine . We notice that these philosophers were , very different from modern philosophers who make every effort to express something new to make from it an expression of their own thinking, as if truth could be owned by a man. We will now see why the ancient philosophers wanted to relate their teaching to this expression “know yourself “or some other similar , and why should we say that this maxim is greater than any philosophy order. To answer the second part of this question , we say that the answer is contained in the original etymological meaning of the word “philosophy” , which was said to be , used for the first time by Pythagoras. The word itself expresses the philosophy of loving Sophia , wisdom, yearning for it or the provision required to acquire it. This word has been used to describe a preparation for the acquisition of wisdom , especially studies that could help the philosophos , or who feels some inclination to philosophy to become Sophos ,meaning wise . Thus, as the mean can not be taken as an end, the love of wisdom can not be wisdom itself. And as wisdom is identical to the true inner self knowledge , we can say that philosophical knowledge is only superficial and external knowledge ,so philosophy has not in itself or by itself a proper value , it is only a first degree in the way of the upper and true wisdom which is knowledge . It is well known to those who have studied the ancient philosophers that they had two kinds of education, an exoteric and the other esoteric . Everything that was written belonged only to the first. As to the second , it is impossible to know exactly the nature, because on one hand it was reserved for the few, the elite and on the other hand it had a secret character. These two qualities have had no reason to be if there was not something greater than the simple philosophy . We can at least think that the esoteric teaching was in close and direct relation with the wisdom which doesn’t call only for reason or logic as is the case for the philosophy that was called rational knowledge , indeed it was admitted by the philosophers of antiquity that rational knowledge , which is , philosophy, is not the highest level of knowledge, it is not wisdom. Could it be possible that wisdom was taught as we teach an external knowledge by word or by books ? It is really impossible and we will see the reason. But we can already say that the philosophical preparation was not enough , even as a preparation because it concerns only limited faculty which is the reason , while wisdom concerns the whole reality of the being . ..